Back in 1985, Starpoint Radio was founded as an alternative music station for London and the Home Counties. Originally broadcasting once a week on Sundays, demand quickly prompted the addition of an entire weekend broadcast and Starpoint Radio soon earned the reputation of being a quality radio station with presenters whose musical knowledge and presentation skills were second to none! Starpoint Radio therefore became known as THE REAL ALTERNATIVE. Over the next three years, Starpoint Radio attempted to broadcast seven days a week, but as an unlicensed station this proved difficult within the rules and regulations of the DTI. In December 1988 it was decided to pursue alternative avenues of broadcasting and Starpoints final show as an unlicensed station was from infamous Crazy Larrys on the Kings Road in Chelsea. In June 1991, Starpoint Radio applied for and received one of the first restricted broadcast licences for a period of twenty-one days and the first show came from the unlikely venue of Windsor Safari Park, covering Windsor, Slough, Maidenhead, and most of Surrey and South London! The following three weeks were a rip-roaring success with the station being able to adhere to its long held principles of quality music and quality presenters without bowing to the pressures of commercialism. The success of the Windsor broadcasts led to Starpoint Radio being approached by Alex Lowes of the Southport Weekenders to broadcast from the legendary event. This resulted in Starpoints management joining forces with another former unlicensed London radio station and the two merged into a satellite-based radio station. With Starpoints connections, this radio station became the official broadcaster for the Southport weekenders. 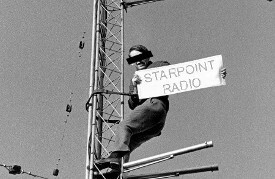 In February 2005, management decided to part ways and Starpoint Radio was reborn. As "The Real Alternative" Starpoint Radio is now the station for quality music and quality presenting! Now broadcasting on DAB to several cities around the UK, and 24 hours on the internet, Starpoint Radio continues to grow each month proving that it is possible to run a quality soul based music station.